New Cosmetics from New York! Bollywood Professional is now available in Malaysia. Are you fans of Bolllywood movies? If yes you will understand that all Bollywood movies are much associated with the vibrant glamour, beauty, romance, song, dance, the hero and heroine. I can’t take my eyes of the heroines features, they have captivating eyes and lips. Well, the secret behind their dazzling looks no longer a secret. Bollywood Professional is used by Bollywood’s top makeup artists for Bollywood superstars in the Bollywood film industry. Finally, Bollywood Professional is now available in Malaysia, London and Mumbai. Bollywood Professional is an exciting cosmetics brand, also carrying skincare and fragrance. Made in New York, and known for its high quality formulas, withstanding studio lights, hot, humid weather and ice cold climates. 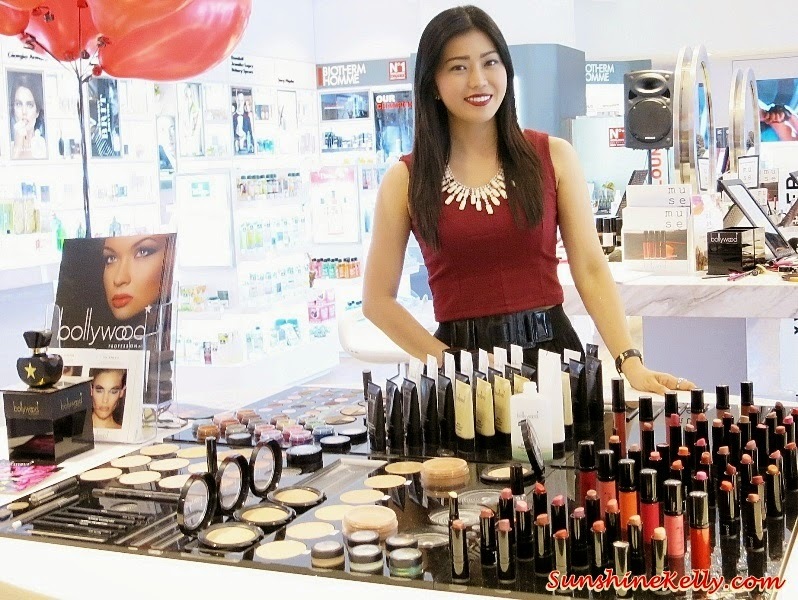 I was at the launch of Bollywood Professional Cosmetics at MUSE by Watsons. I met the Rani Birring, the founder of Bollywood Professional. She is so stunning, experienced and tall like a model plus so friendly. Not only we love the brand we also like her hospitality very much. Bollywood Professional has a wide range of colors cosmetics and the highlight of the event was the launched of their new Liquid Lipstick that is available in 12 shades. Selling at RM92. The one that I am wearing is Uncorked, which is the deepest color in dark wine. It provides the super creamy, non-sticky coverage with luxurious liquid texture. The color is intense pigment delivers fabulous full coverage color in a single swipe and long-lasting. Ultimate Instant T-Zone Mattifier - makeup base that absorbs excess oil. Retexurizing Face Primer SPF20 - reduce the fine line appearance and provides instant glow. Mineral Photp Touch Foundation – light weight and luminous finish. Rani also introduced two fragrances, bollywood. Bollywood was based on jasmine, vanilla and sandalwood, and was tagged Scent of Seduction. It was described as ‘’truly addictive, powerful and captivating”, and again, was a sell-out in Bollywood, and became ‘’the fragrance for Bollywood Superstars’’.